Taipei, Oct. 27 (CNA) President Tsai Ing-wen (蔡英文) welcomed Guam Governor Eddie Calvo and his delegation at the Presidential Office on Friday and thanked them for Guam's backing of Taiwan in the international community. During the meeting, Tsai thanked Guam for its support over the years for Taiwan's involvement in international organizations such as the International Civil Aviation Organization and the United Nations Framework Convention on Climate Change. "Taiwan is happy to have a friend like you," the president told the officials from Guam. 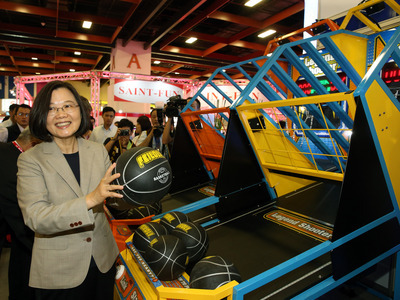 Tsai will soon make a short visit to Guam. She will transit there on Nov. 3 on her way back to Taiwan after visiting three Pacific island allies on a trip that begins tomorrow. She thanked Calvo in advance for any assistance and hospitality Guam will show her delegation when it stops there in a week's time. Tsai, meanwhile, invited residents of Guam to take advantage of the 90-day visa free privilege they have to visit Taiwan to encourage more people-to-people exchanges between the two sides. Currently, about 50,000 Taiwanese visit Guam annually, making it the third biggest source of visitors to the U.S. territory behind Japan and South Korea. Guam is especially popular for vacations, weddings, and honeymoons amongst nationals.